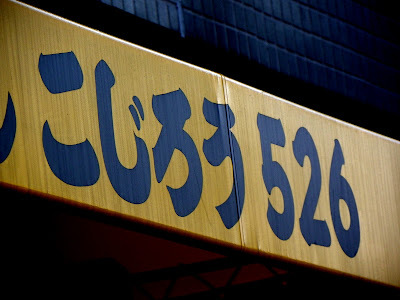 If you're a proponent of the Okinawan philosophy "Hara hachi bu" (To eat until you are 80% full) then Kojiro 526 probably isn't the place for you. It's about a 10 minute walk from Mikawashima station (Maybe a little further from Nippori and Uguisudani) but a 15-20 minute walk back. In saying that it is well worth the walk. This isn't part of the famous Ramen Jiro franchise but it does have a similar style of tonkotsu shouyu soup and the same black lettering on a yellow background. Maybe a brother? Kojiro 526 definitely deosn't have the same popularity as authentic Jiro stores around Tokyo, presumably because it is essentially hidden by a vending machine. I went there on a Friday afternoon and there were only 3 people occupying the 12 or so seats in the store and by the time I managed to finish (for want of a better word) my meal, I was the only customer. 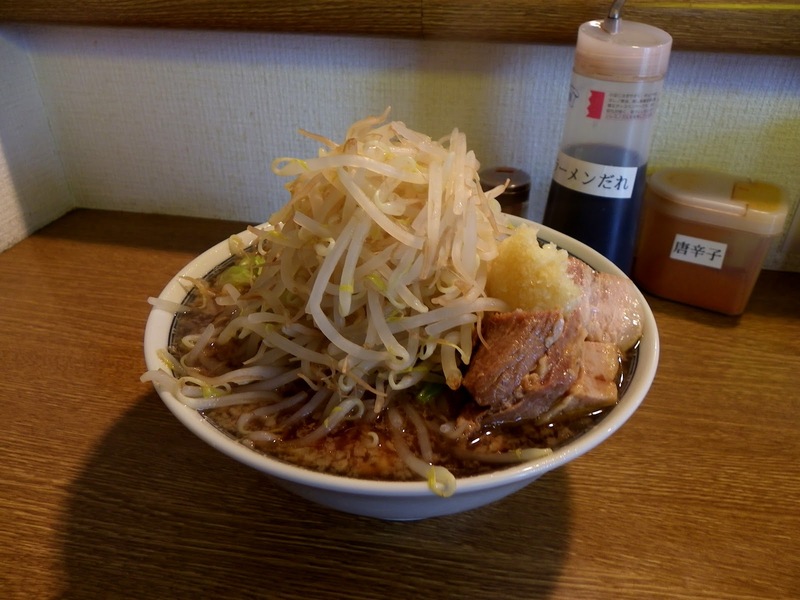 As at a Ramen Jiro, you'll be asked what toppings you'd like. I opted for the vegetables (cabbage and bean sprouts) and garlic. I wasn't quite expecting as much garlic as I got and I can still taste it now, but it certainly enhanced the flavour of the soup. I was expecting a big bowl but not one that was overflowing like the small mountain that arrived. I would recommend the smaller size noodles (180g compared to 250g,) unless you're feeling particularly manly. 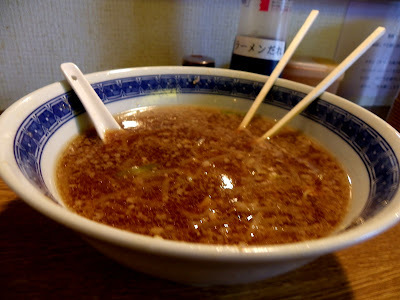 Initially it was quite difficult to eat anything besides the bean sprouts without spilling some soup. The chashu was the real star of the show though. 2 big chunks of pork with a layer of fat that melted in your mouth. It also had a sweet, salty taste and was just the right amount - comparitively! There was enough to break up the constant barrage of bean sprouts and noodles, unlike some places where the meat is gone unless you diligently ration it as you eat your noodles. Be aware that there isn't any water available inside, but don't fear as it is only a short trip to the nearest vending machine (! ), and that the spoons are disproportionately small and a little dinky in comparison to your enourmous bowl of ramen. Unfortunately, this was the best I could do (on any empty stomach) but this one's pretty close to home so I'm sure I'll be back.